Living in your cousin's shadow can't be easy. 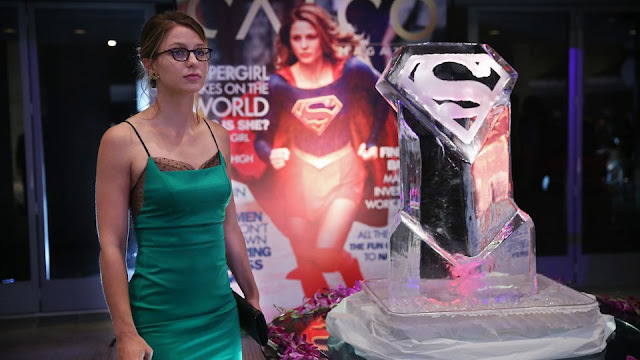 Just ask Kara Danvers (Melissa Benoist) who as CBS's 'Supergirl' continues to remind us through three episodes in the show's rookie season. A rookie hero herself she tries to stand on her own but when a foe of Superman decides to take out his revenge on her it requires the Man of Steel to bail her out. I'm just hoping it doesn't become a crutch to use James Olsen's super-alert-watch to call in Big Blue every time Kara gets in trouble. In this universe, Superman looms large as the most powerful established superhero so it would make sense that Supergirl's emergence would pale in comparison. This has been addressed multiple times as Supergirl is underestimated and compared to her cousin. She insists she wants to carve out her identity even through adversity. The struggle is real but how long can Supes show up without showing his face to the camera? Ben Krull, dubbed Reactron by James, has been battling Superman for some time we learn and he's looking to exact revenge. Krull's wife was killed when Superman was unable to save her while preventing a nuclear explosion and was hit with a deadly amount of radiation. Krull survived and developed a way to harness nuclear energy. Having lost someone he loved, Krull wants Superman to feel the same by targeting Supergirl. Reactron kidnaps tech mogul Maxwell Lord (Peter Facinelli) as bait to lure Supergirl and when she's overmatched against the non-metahuman, Superman saves the day. We don't see his face of course because that would involve casting an actor not named Henry Cavill to play him. And then you'd have to pay that person to talk but why do that when you can just show his encouraging instant messages, emojis and all, to Kara after she cleverly defeats Reactron in the end? If nothing else, Superman's influence on 'Supergirl' separates it from other comic book shows on television. Kara has more to prove than Oliver Queen or Barry Allen. She's burdened with carrying the feminist flag in a world of male heroes, one who happens to be family, working under a high maintenance boss (who's also a harsh mentor), and still learning how to be a hero. It's a lot for one woman, but it's part of the growing pains for her, and the show, that's balanced by her sense of justice and enthusiasm for doing good. She's more than capable but still learning. The biggest progress this week is the continued growth and development of the supporting characters. The whole Kara/Alex relationship seems more believable beyond the constant encouragement and acknowledgements of trust. A scene as simple as them kicking back eating not talking about their feelings constantly and being real, "I hope you get fat," as Kara gets the last pot sticker adds some depth and dynamics that feel authentic. James is also revealing more of himself as a bit insecure and protective. He's quick to call in the calvary to help Kara even if it hinders her growth. He's expressing concern even if it's a little misguided because he feels powerless to do something himself in this new metahuman landscape. Even Cat gets to show her journalistic skills while not staying humble and flirting a bit with Lord. She's been allowed to show some new layers beyond her grumpy aloof exterior. Even though the DEO stuff seems to be the weakest points so far on the show, Hank "Red Eyes" Henshaw seems to be warming up to Kara as part of the team. I'm sure we'll find out if he turns out to be Cyborg Superman as in the comics or Martian Manhunter as some on the internet have wondered. Lucy Lane (Jenna Dewan-Tatum) made her debut and as James' ex-girlfriend is sure to complicate things for Kara if she's starting to fall for him. There's plenty of personal drama for sure but I'm hoping the super crime-fighting continues without more help from her cousin and wins or loses on her own merits. Check out this preview for next week's episode "How Does She Do It?" "How Does She Do It?" - Kara’s two identities are stretched thin when Supergirl must protect National City from a series of bombings and Kara is tasked with babysitting Cat’s son, Carter. Also, James is conflicted when his ex-girlfriend Lucy Lane seeks to rekindle their relationship, on SUPERGIRL, Monday, November 16th on CBS. Levi Miller guest stars as Carter Grant, Cat’s son, and Jenna Dewan-Tatum guest stars as Lucy Lane.